Great post for IWW. Thanks, Dave! 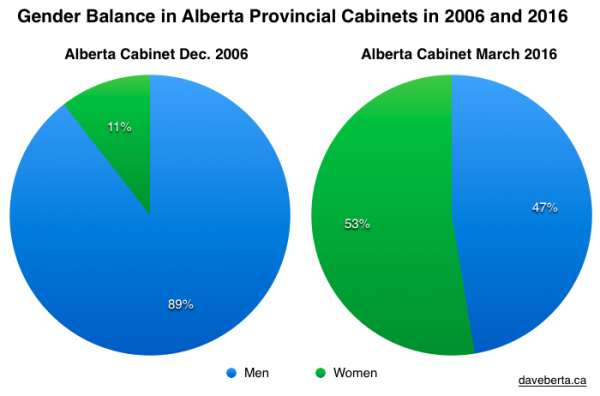 And even with the women running the show in Alberta–things are no better. I guess good performance is dependent on will power, courage and relentless determination rather than gender. 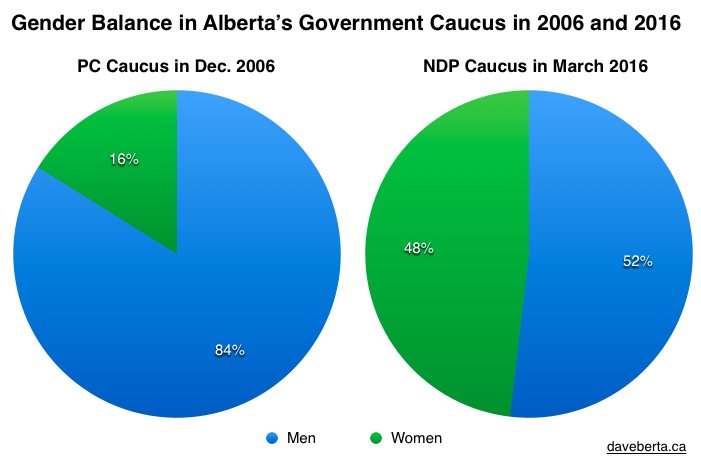 I have yet to see good performance from the NDP government with its slight majority of women folk. Although it is productive to have more women in power in Alberta what really counts are deliverables, relationships with constituents and acting on our issues. The PCs were able to be productive for a short period of time before they went on autopilot but the NDP haven’t been productive from the very start. I have been waiting for action in the area of continuing care legislation and so far the government has been very apathetic about seniors and their continuing care issues. With reference to continuing care issues there is no change. It is business as usual. The continuing care standards were slightly tweaked and mostly ignored. The retribution issues (banning, evictions and legal retaliation) were ignored for the most part until they got some press attention. Then Sarah Hoffman and crew at Alberta Health came up with the “Visitor Management Policy” business that was supposed to be done at the end of March, 2016. Where is it? I’d say it’s somewhere in the multiple layers of bureaucracy at AHS. What exactly is a “Visitor Management Policy” you ask? It’s a weak attempt to solve the problems of the Trespass to Premises legislation which results in banning of families/advocates at continuing care facilities/hospitals. Instead of doing the work of amending the legislation to require an independent appeal when folks are banned verbally, or in writing, Sarah Hoffman opts for the weakest possible solution. Instead of legislation we get policy. And we all know how effective policy is at AHS where our family waited months for an appeal policy to reverse my handicapped sister’s eviction from long term care. As soon as we got that appeal policy, Covenant Health and AHS subverted the used of the policy by downgrading my sister from long term care status to SL4 status so that the appeal was mote at that point. A policy can be subverted in this way but legislation requiring an appeal cannot. A policy is also modifiable and use of the policy is dependent on the authors of the policy. In the case of the appeals process policy, AHS has full control of the gate and fencea round any policy such as the appeals policy; it decides who gets to access this policy. In other words, very few of us will access the appeal policy since this will result in some dirty linen being washed and hung out on the public line. In Alberta this is a big no no and usually results in major angst in government. The tendency is always to present a perfect performance record. In reality the performance in continuing care has been spotty and in places, downright poor. So if the appeals policy is so controlled what do you think will happen with the “Visitor Management Policy”? It will be as well controlled and most banned folks won’t get to use this policy. It’s also curious to me why visitors have to be managed. What about the administrators of these facilities as well? Who manages them? Or are families so much of a threat to administrators and staff that our chatter can only be silenced by the use of the banning threat to separate us from our loved ones? It’s a curious matter to me that we cannot sit down and openly speak about adverse events in our continuing care facilities and hospitals but must do the moving forward of families so as to write over a history of adverse events. The Health Quality Council of Alberta should do some longitudinal studies of the incidence of adverse events in Alberta over time, both in the past and into the future. Based on the findings, we would then know if adverse event discovery by families result in banning events or other retribution acts such as evictions and lawsuits. This sort of data seems to be surprisingly hard to find in Alberta. No one wants to talk about these problems. As a consequence, the public is mysteriously ignorant about the problems of yapping about adverse events in public. It is time the NDP government got to work. The majority of the time I hear nothing from the MLAs I contact. The presence of more women hasn’t improved the lack of transparency or accountability of government. Most of the change in government appears to be merely— in the number of women elected to the legislature. Unfortunately having the women in power hasn’t changed anything for ordinary citizens who are under the boots of power at all levels. Power seems to be a very private controlled resource in Alberta. It is pretty interesting to see how power is controlled. It is also interesting to see how government in Alberta determines how much power will be given to citizens. In most cases the power given to citizens is limited or outright bogus. You have these silly policies provided to us by the NDP folks at Alberta Health which have limited efficacy. Then you have the legislation / policies provided by the Progressive Conservative Party of Alberta which were all designed to ensure that citizens felt they had some power but in reality they had none. Some of the legislation created by the PCs in the continuing care and health care areas include-the Protection for Persons in Care legislation, the Ombudsman Office, the Health Advocates Office and the Health Quality Council of Alberta. These bodies have no power to change anything. They all simply give the show to citizens. Yay! We have power. But you go make a complaint. The complaint is reviewed and there is a finding of some sort. But can any of these bodies make change happen? Well the Ombudsman can say you were unfairly treated as in the case of Shauna McHarg but there is no way the Ombudsman can do anything more than this. It’s all a pretence. the Ombudsman’s decision which also had favoured McHarg. been emasculated by the court decision. & the Freedom of Information Office, over 6M. All these offices cost us major bucks. They provide the government of Alberta with press releases. They provide citizens with mazes to run to dead ends. But I guess at least we have them around using our taxpayer dollars to provide us with the façade of good governance that even the presence of more women at the top–can’t actually provide us. Most of the women I know would be horrified to think they were being promoted, or otherwise had any unfair incentive to get elected, other than for their abilities, work history, or personality traits the public admires. The public cares about ability to serve them well, with minimum embarrassment to the jurisdiction, selfish things like “what this person will get for me”, and whether they can serve honourably. In the Ward 12 By-Election I witnessed hundreds of women disembowel the 6 females in the race because each lacked the focus or “killer-instinct” attributes that men are bred with. Don’t hate me, I’m just the messenger. That said, wome totally deserve equal payment for the same duties, like my wife gets with an employer that appreciates and needs her talents. Happy Int’l. Women’s Day!! It does women a disservice to just promote based on gender. Qualifications need to be the first criteria, something that the NDP government clearly has overlooked. But hey, it’s only a $50 billion budget. Uh, nowhere has it been said in this article or otherwise that the women promoted were done so on the basis of their gender alone – enough with the strawmen. Absolutely ridiculous to take this post highlighting a significant event in Alberta and bring a stupid flame war topic in. Also, Nick, no offense (or maybe total offense, I’m not sure), but your commentary there goes a long way to explaining why you were in the bottom of the pack for Ward 12. If you had said something like that to my face at my door or on your literature, you would not be receiving a warm welcome.